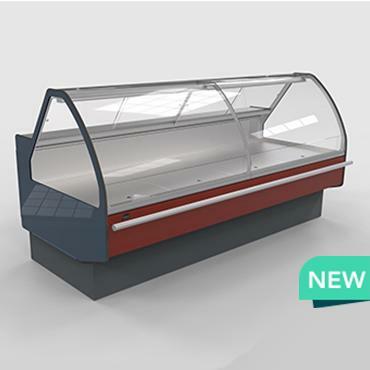 This is our newest refrigerated serve over counter with an additional refrigerated storage capacity with the doors from the back of the counter. This serve over is characterized by stylish design with smooth rounded glass to promote your products and make them look attractive for the customer. Also, large display area of the counter gives you freedom to place a lot of merchandise. The interior details are made of stainless steel to ensure durability and protection against rust and bacteria, and are easy to clean. All the above makes Rhea S an ideal solution for any store or food market. Remote or plug-in versions can be chosen according to your needs. Plug-in versions possible with refrigerant R134A, also nature-friendly refrigerant R290 (complies with the EU F-Gas Regulation No. 517/2014).